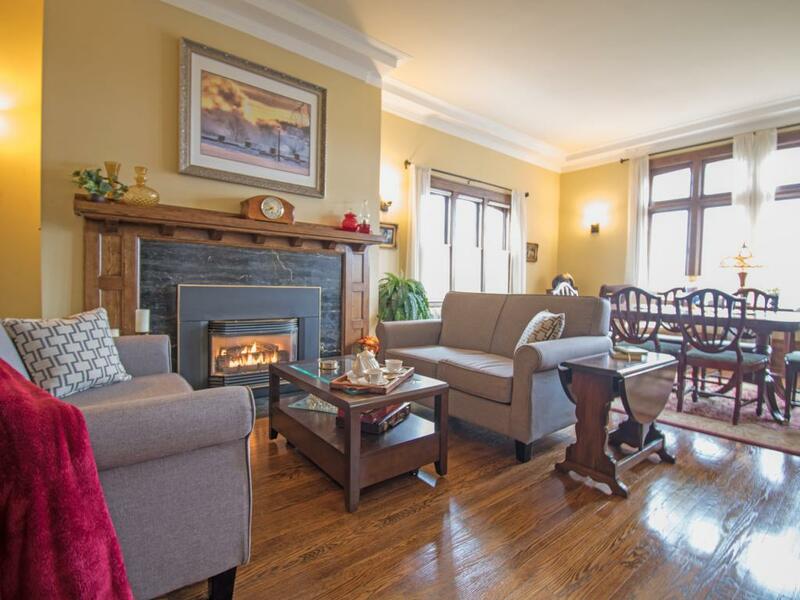 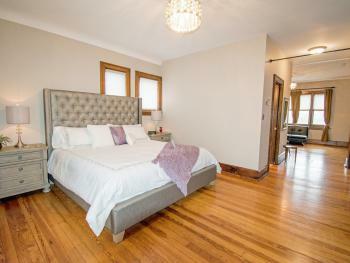 This spacious, bright room is a guest favourite at Greystone Manor Bed and Breakfast. 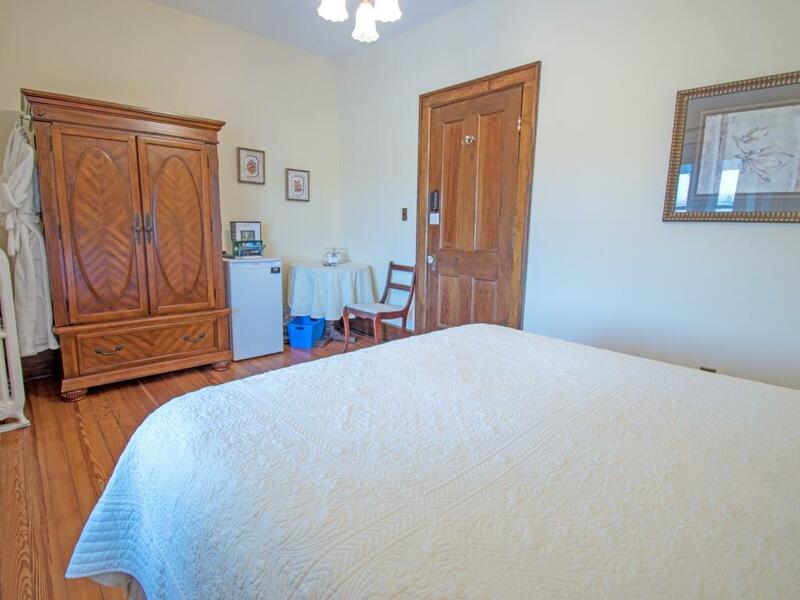 With its traditional furniture, there is a harmonic balance in this tranquil room. 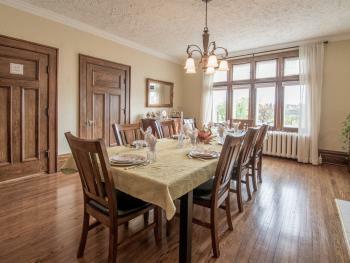 All of the doors, door frames and baseboards in this room have had the layers of paint removed to restore the original stained hardwoods. From the bedroom, guests will step down on two marble steps to the private, en suite bathroom which offers the original hexagonal tile floors, subway tiled walls and soaker tub (updated with a shower.) 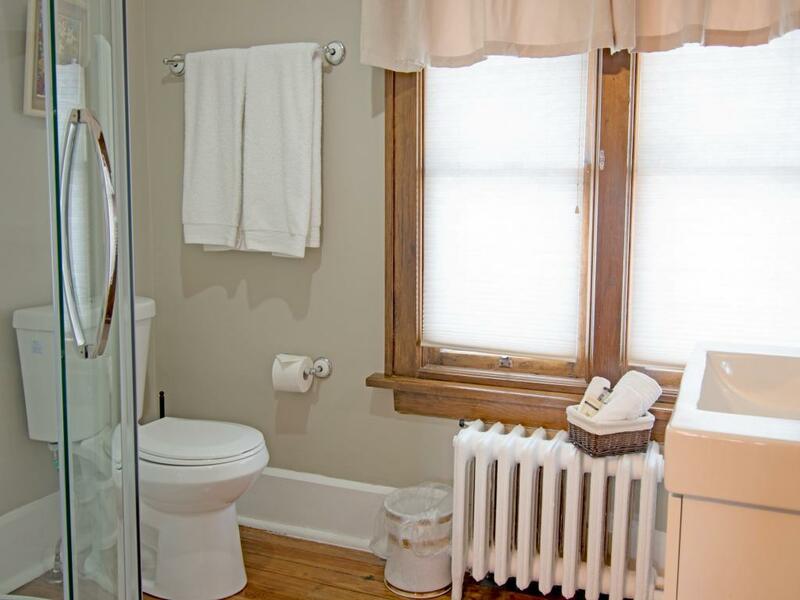 A wall-mounted hair dryer is provided for your convenience. 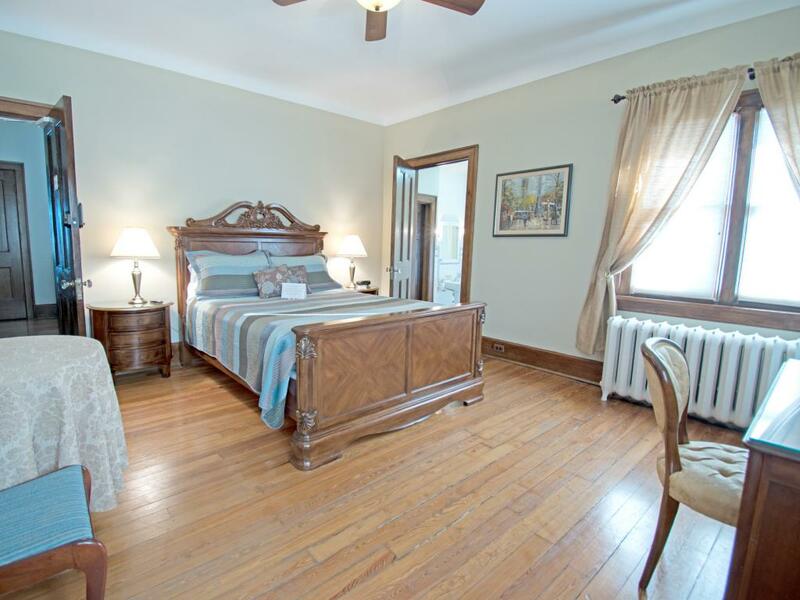 This charming, bright room has one of the best views of the Niagara River Gorge from Greystone Manor Bed and Breakfast. 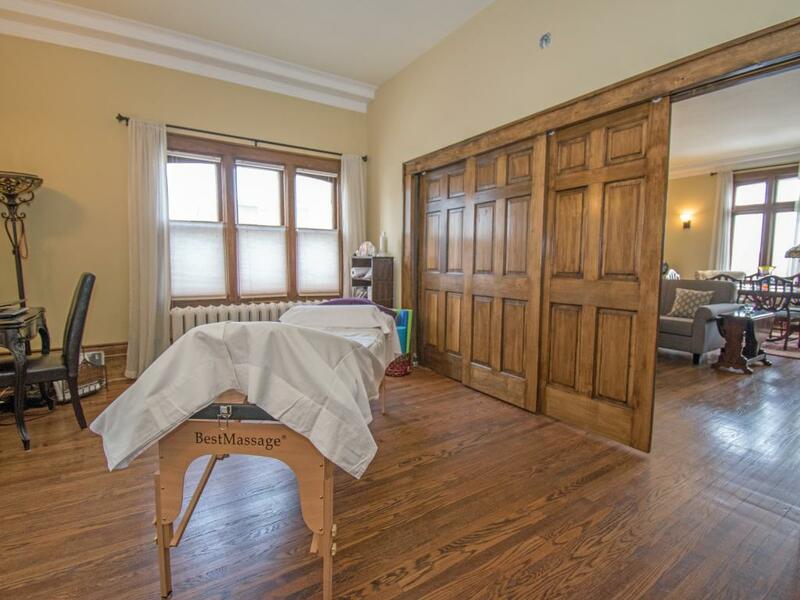 The muted tones of this room highlight all of the restored century old, original woodwork. 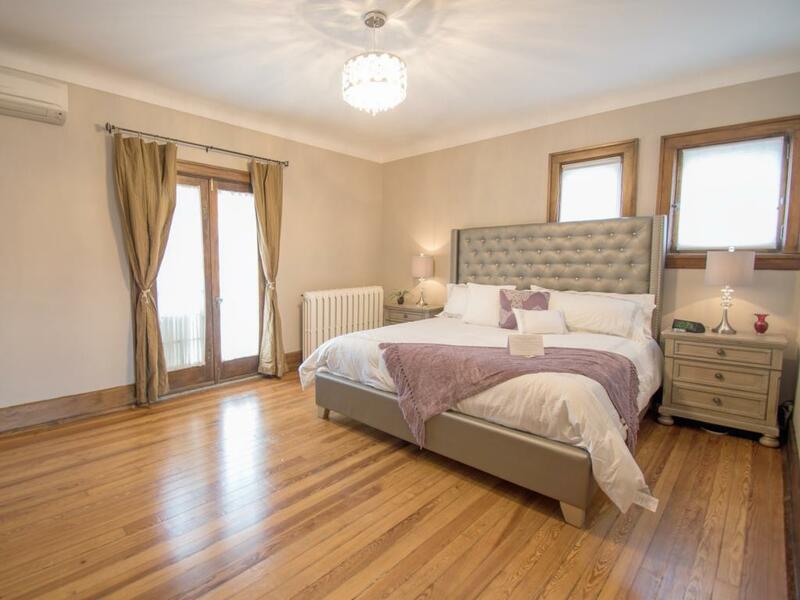 This incredibly spacious suite offers a king size bed, balcony with city view, en suite washroom with tub, a separate sitting area with two futons that have a wonderful river view. 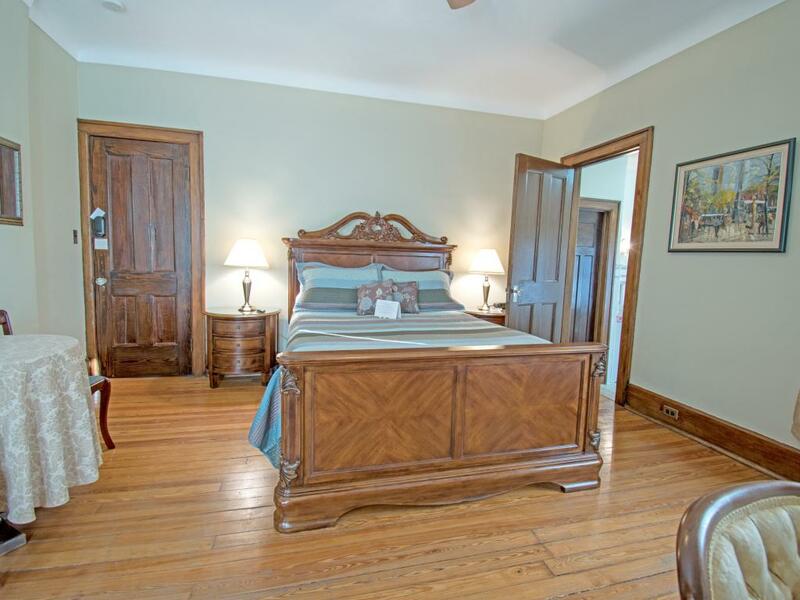 This suite is the perfect place for a romantic getaway, the honeymoon couples retreat or that group of friends away for the weekend. 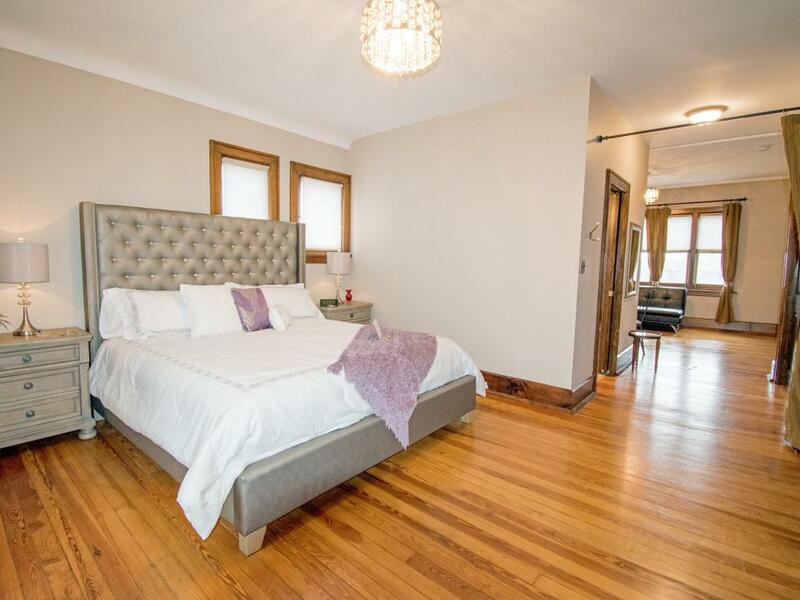 This room may accommodate up to 4 guests in total with 2 extra guests sleeping on pull out couch at an addition rate of $40 per person for the additional 3rd or 4th person. 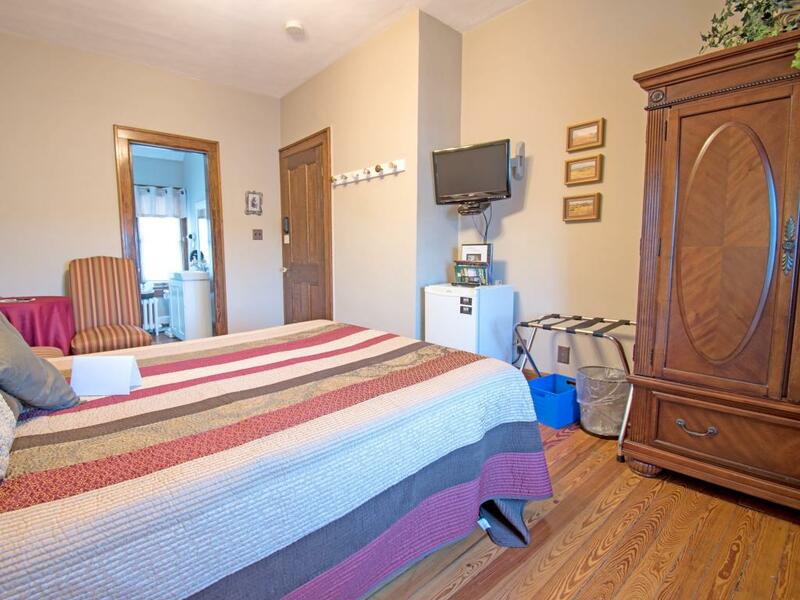 Other amenities in this B&B guest room includes central air conditioning with in-room remote control, refrigerator, flat panel TV with premium cable service and Wi-Fi internet access. 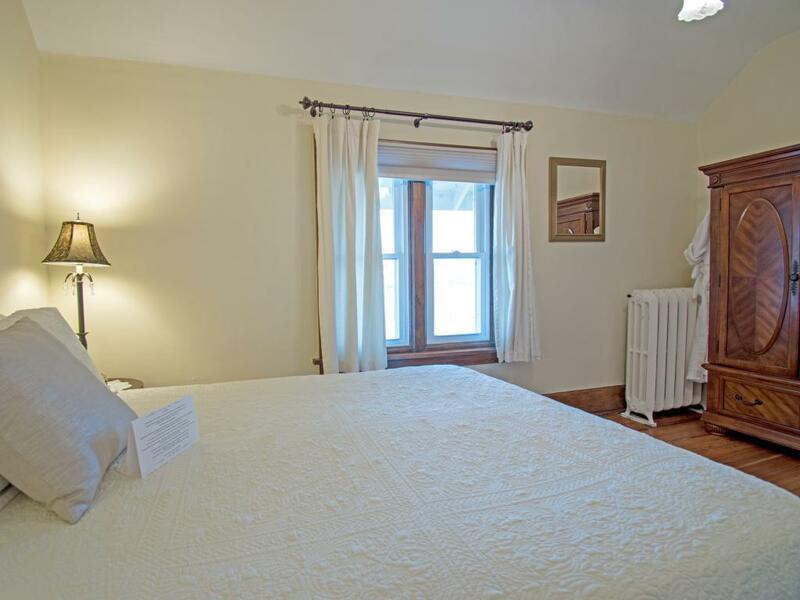 This bright room overlooking the Niagara River Gorge is our budget-friendly guest room at Greystone Manor Bed and Breakfast. The room is simply decorated and offers central air conditioning with in-room controls, a queen-size bed, mini refrigerator and clock-radio. 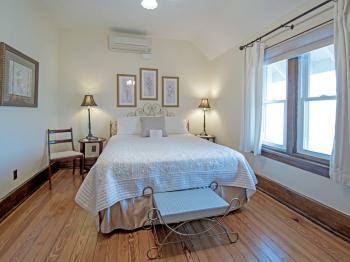 As with everyone on the property, guests of the Pearl room have free Wi-Fi internet access. 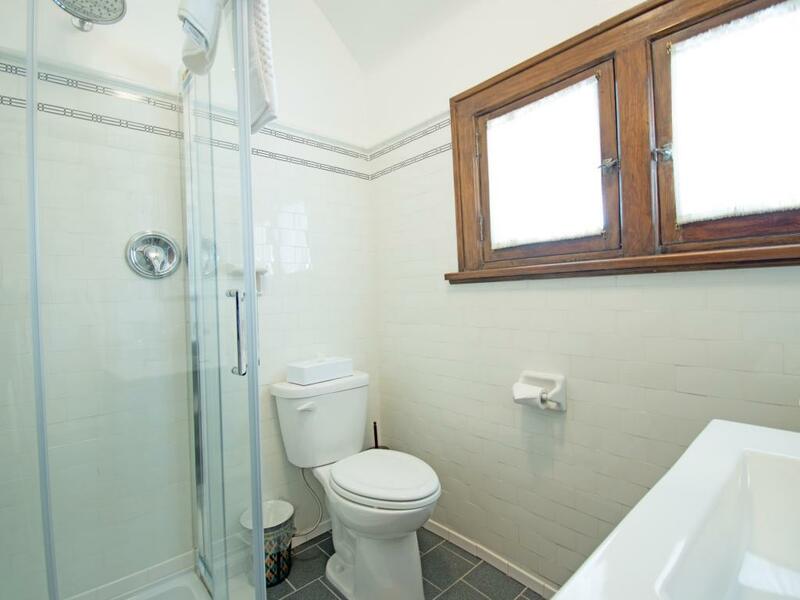 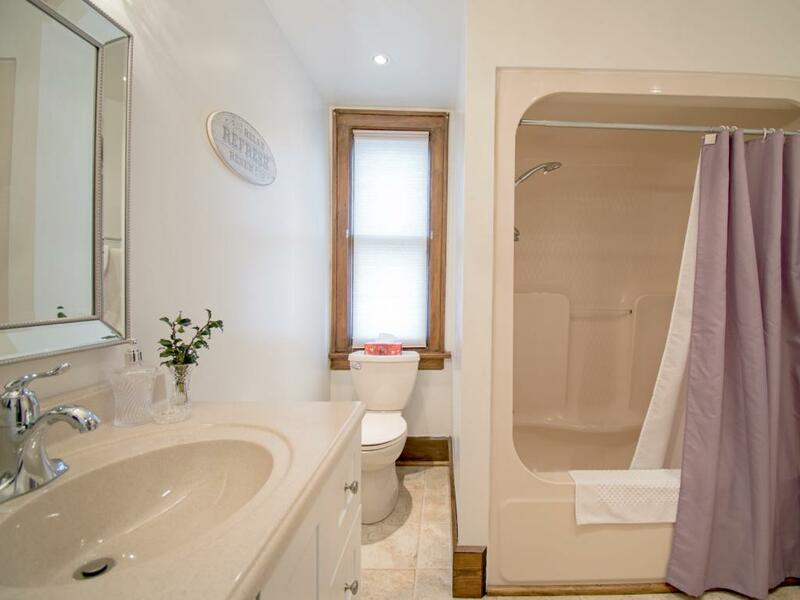 Please note, this guest room offers a private bathroom which is located across the hall (it is not en suite) The bathroom has a shower (with narrow sliding doors), toilet, sink and hair dryer. 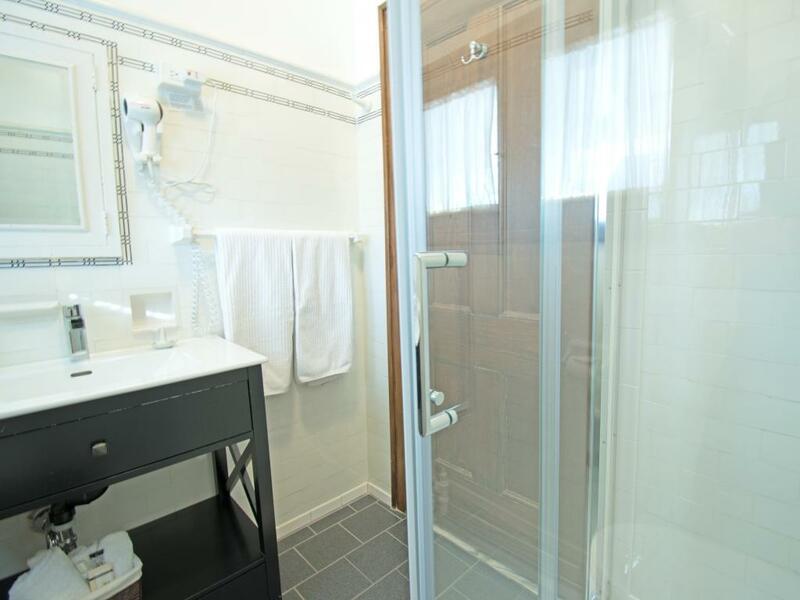 For their comfort, guests of the Pearl room are provided with complimentary bathrobes. 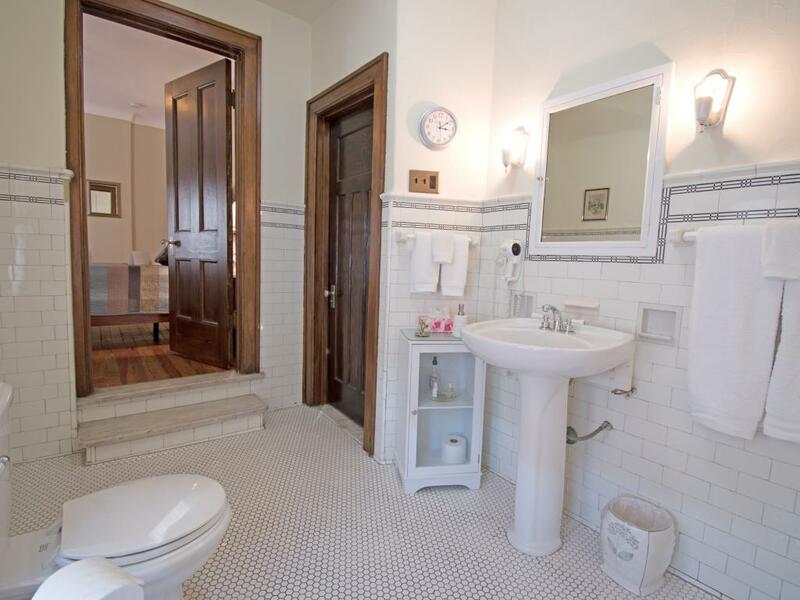 After years of renovations, the charm of yesterday and the modern conveniences of today came together to create a gracious and unique, yet comfortable home. 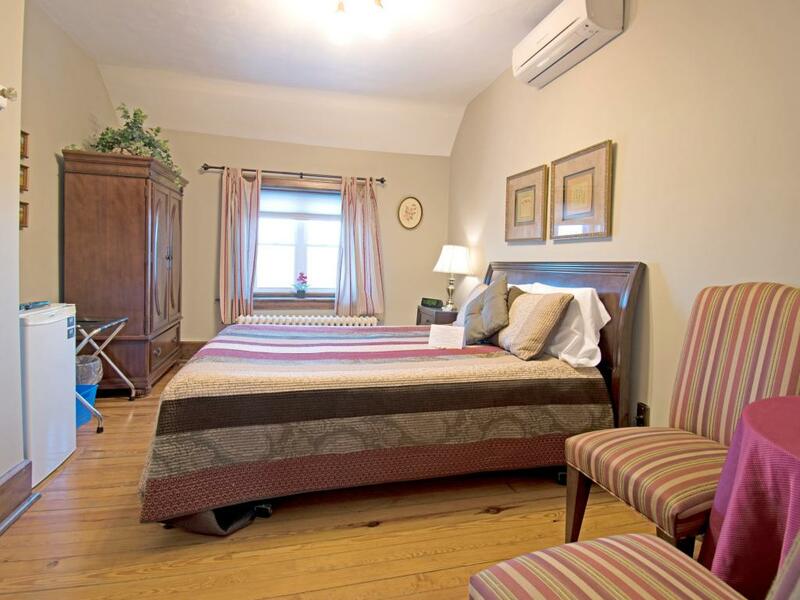 The bed and breakfast guest rooms are spacious, offering queen size beds, central air conditioning with in-room controls, mini fridges, TV , wireless internet access and private bathrooms (most en suite) with hair flow dryers . 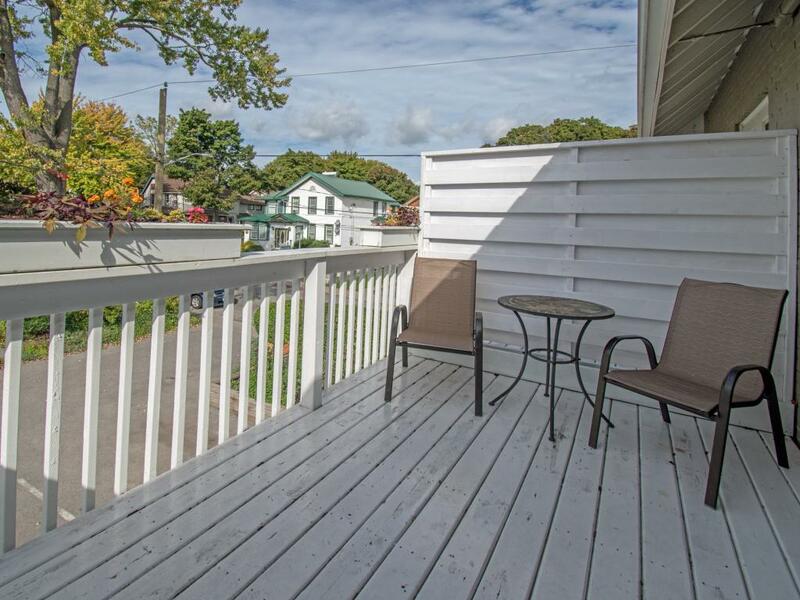 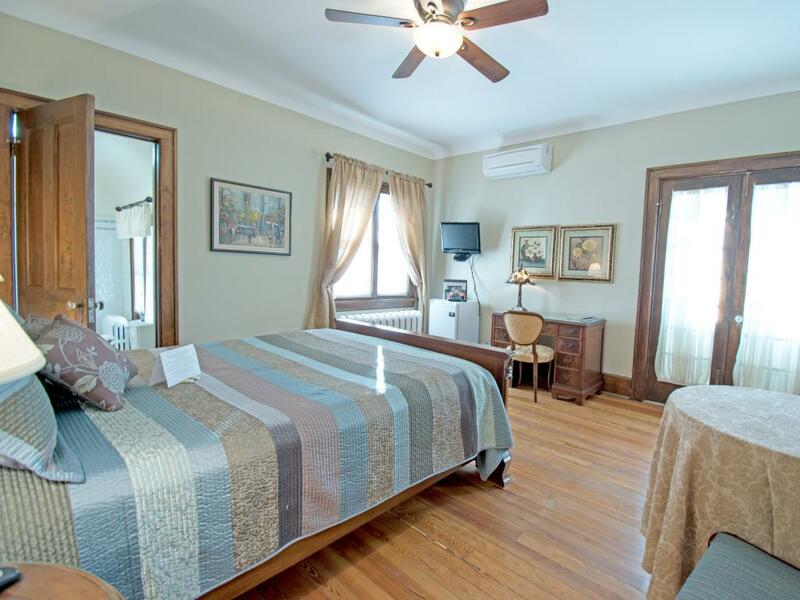 Each B&B guest room is unique with features such as a private entrance from the front garden, views of the Niagara River Gorge or French doors that lead to a second level balcony. 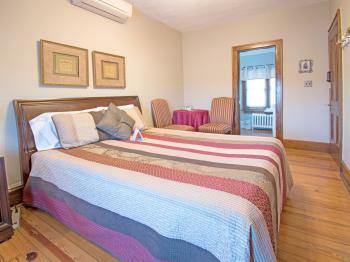 From 3 of the rooms and the common area, one can enjoy the panoramic view of the Niagara Gorge. 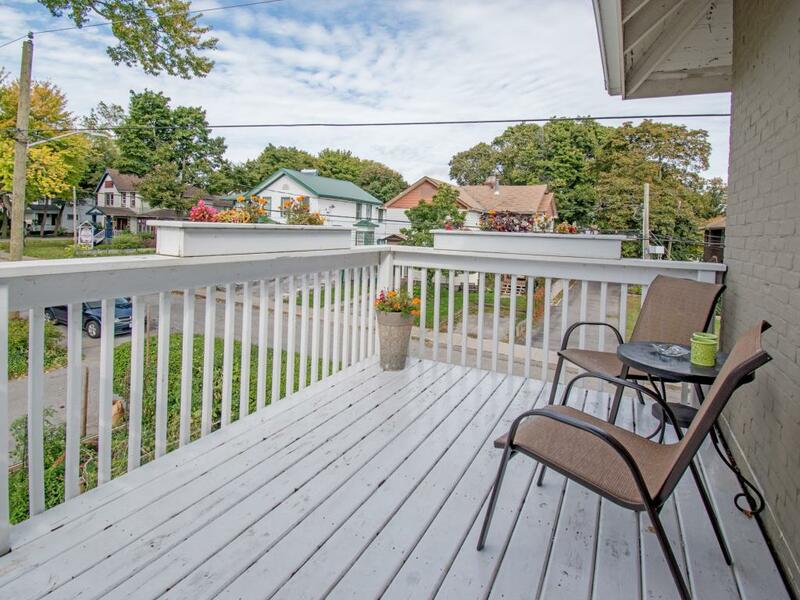 And in the calm of the morning or evening, from the front porch of Greystone Manor Bed and Breakfast, one can hear the powerful rumble of the Falls . 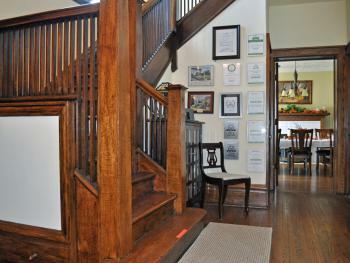 The area offers points of historical interest also. Heading south from Greystone Manor guests may enjoy a stroll about 20 minutes to the point known a Table Rock which is at the brink of the falls. Or stroll about 10 north to Queen Street which is the true downtown of Niagara Falls. One will notice that this area is eclectic with homes and business large or small, new or old. 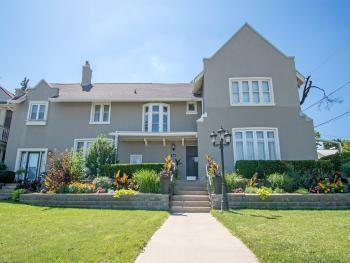 The few blocks along River Road closest to Greystone Manor Bed and Breakfast feature older stately homes. This is due in part to the fact that in 1897, the Niagara Falls Chamber of Commerce announced that the two mile area between the Falls and the Falls View Suspension Bridge would be developed for businesses and upscale housing. 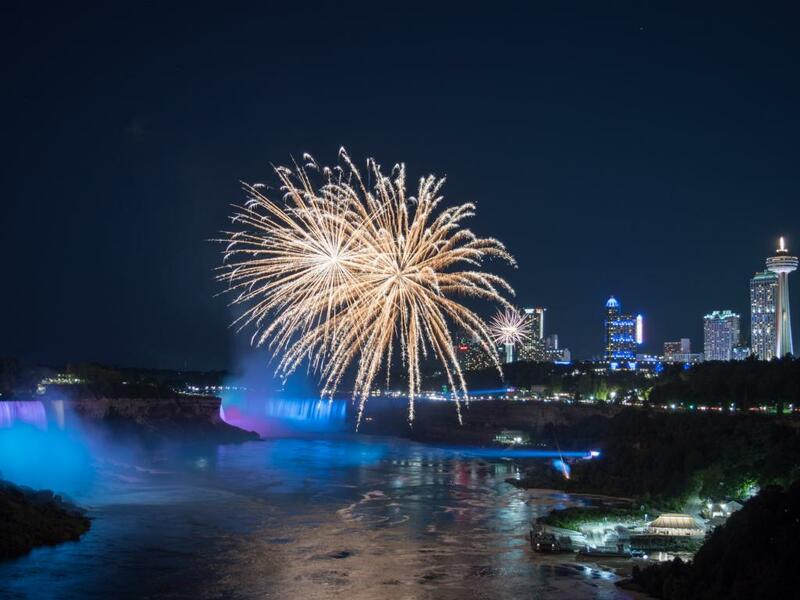 By 1900, the age of electricity converted Niagara Falls into a boom town. 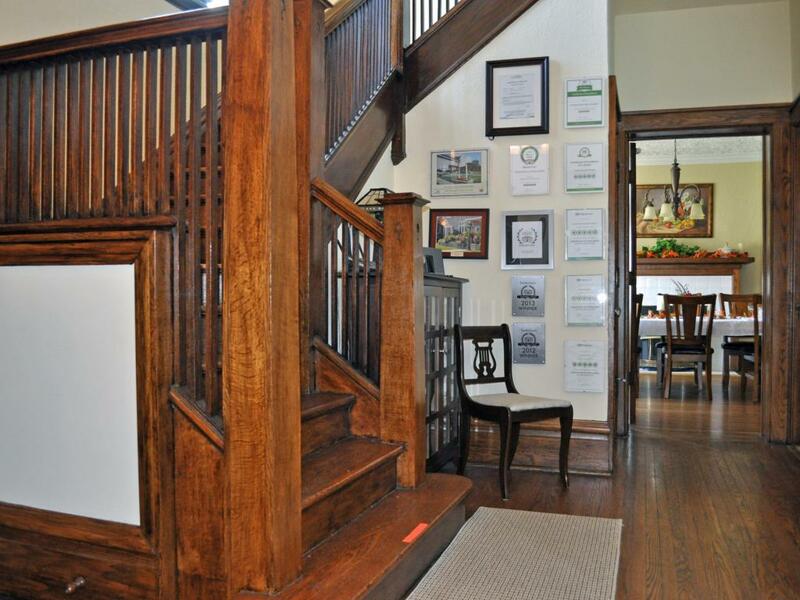 In the early 1900's, concerns over pollution became a major issue and Henry D. Perky of the Natural Food Company spearheaded a pollution clean-up drive. The result of this drive was the removal of the majority of mills from the famous Mill District along the edge of the Niagara gorge downstream of the Falls over the next forty years leaving the grand and stately homes. 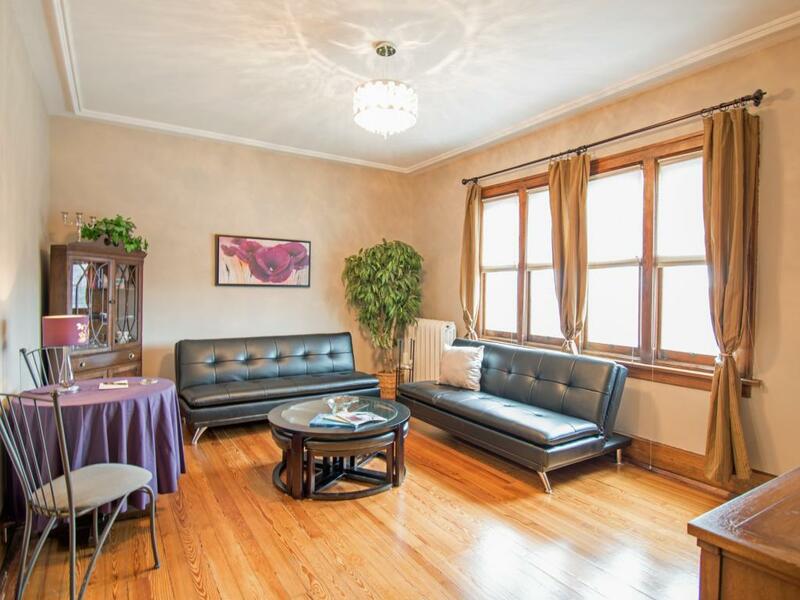 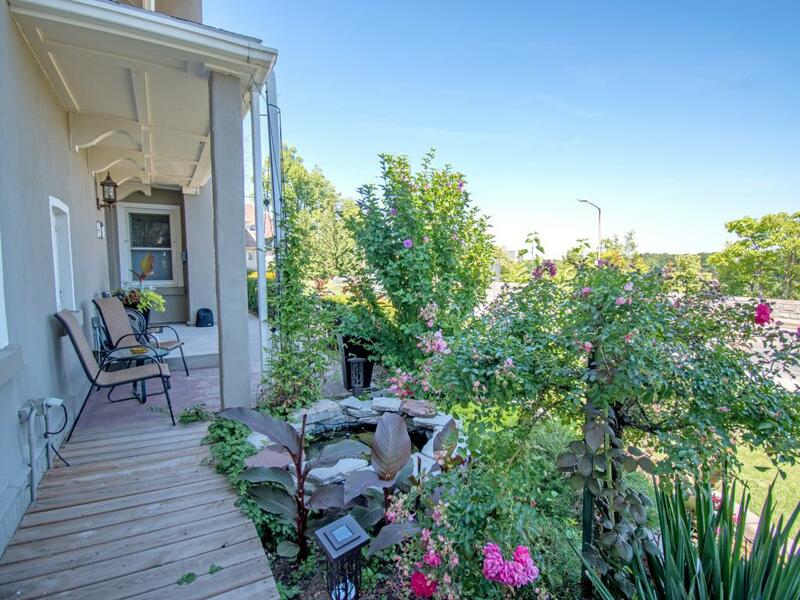 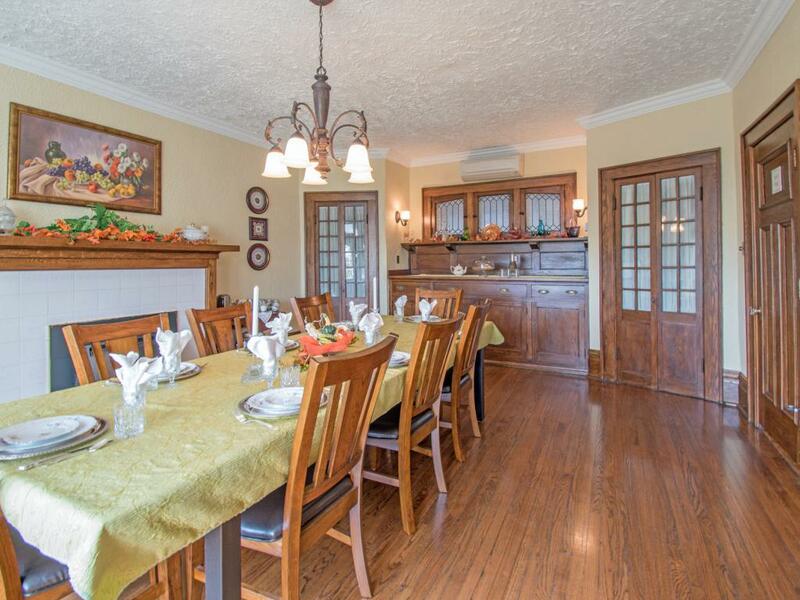 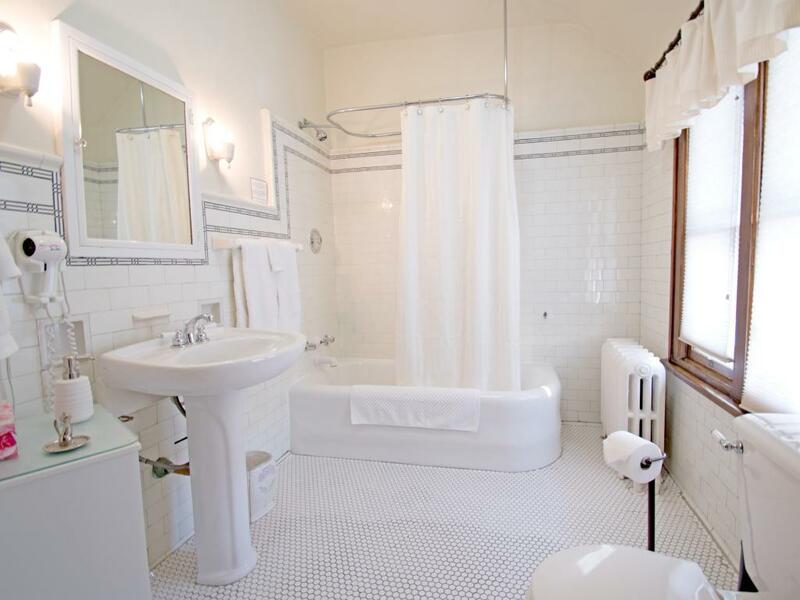 In Niagara Falls , Canada this charming B&B is located between the Whirlpool and Rainbow Bridges which are the entry points to United States of America . 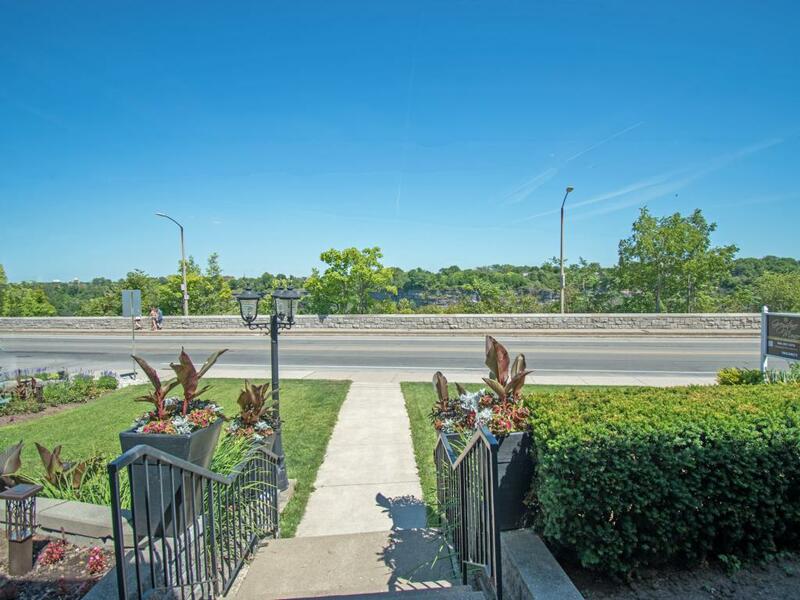 Along the Niagara River just a few minutes north of The Falls and overlooking the picturesque Niagara Gorge, one can enjoy peace and quiet while being just a short walk from the vibrant tourist area . 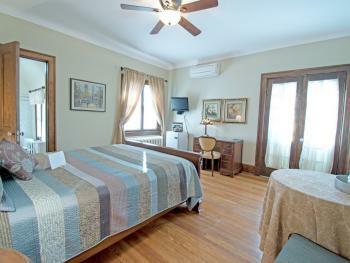 Greystone Manor B&B is within a short driving distance to the many other attractions which Niagara Region has to offer.